While I mostly skated through school with minimal effort, science was something which, once I progressed beyond the basics, continually confounded me in school. I want to be clear: I do not blame my teachers. This wasn’t a single year where I failed. It was a repeated failing from middle school into college. This remains, to today, a major consternation for me. I joke that as far as I’m concerned all science is, is magic. But that’s a joke to cover my discomfort with my relative naivete with the subject. So when I tell you that I have been eagerly waiting for the new Cosmos series for two years, I want to make clear it is not because I am some sort of science nerd. When news broke that Neil deGrasse Tyson and Seth MacFarlane were working on it, I was cautiously excited. And for two years I would occasionally check in on the show looking for news on its production. Finally they announced the air date and I marked my calendar. March 9, 2014. I will be honest, the reason I am so excited for this series, is that I hope to perhaps break through the wall which has stood between me and more-than-casual understanding of science. 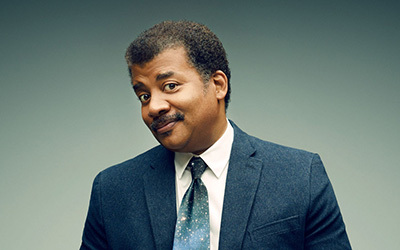 I am hoping Neil deGrasse Tyson succeeds where I and my previous science teachers have failed. But more than that, I hope he succeeds in igniting the spark of science in those younger than me. The first episode succeeded in many ways, it opened my eyes and explained things which I didn’t understand before. From the multiverse theory, to the rings of Saturn, to the utter depth of time since the universe began. Here’s to next week’s episode!